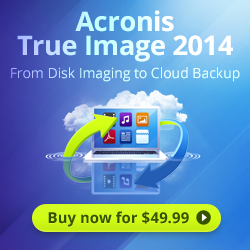 Acronis TrueImage 2014 comes with a multitude of additional tools including a proprietary Acronis boot manager, a proprietary “recovery zone” that TrueImage can use when you can’t boot to Windows, and a management utility for Windows’ built-in boot manager. It includes folder synchronization tools. It can send backup files via e-mail. It even offers its own cloud-based storage system, Acronis Cloud, with 5 GB of free storage, or 50 GB for $29.99 per year, or 250 GB for $49.99 per year—lower prices than most rival storage services. And a Premium version ($79.99) adds tools for migrating systems from one machine to another and working with Windows dynamic disks. Despite its complexity, TrueImage starts up with a simple three-panel dialog with buttons for backing up a system, recovering data, and backing up to Acronis Cloud. These buttons lead to moderately complex menus, but beginners should have little trouble navigating them, as long as they accept the defaults. Experienced users will understand options like “Switch to disk mode,” which lets you setup backups of an entire physical disk, not just individual partitions inside it, but keep your tech-challenged relatives away from it. The default settings create a full backup, followed by “incremental” backups that back up only files that changed since the full backup. Advanced options—all of them on colorful, spacious menus—let advanced users choose potentially data-saving options like one that makes a spare copy of a backup in a separate location. If you want to perform a file-or-folder backup instead of a full-partition or full-disk backup, you have to go back to the opening screen, and click on a “Backup and Recovery” tab where a toolbar offers all the app’s different backup menus and the main window gives details on backups performed earlier or currently in progress. A separate tab for Synchronization provides similar options for setting up local or cloud-based file sync operations, all of when went smoothly in my tests. Other tools and utilities on the same menu include an ingenious Try&Decide option that “sandboxes” your hard disk so you can make install software or make other changes without permanently writing the changes to disk unless you decide to do so. I’m not sure I would recommend trusting your disk to something as intrusive as this, but it worked perfectly in a brief test. Other tools are even more intrusive, like one that creates a proprietary “secure zone” on your disk for preserving recovery data. I intensely distrust any software that makes proprietary changes in my hard disk structure, and, a few years ago, I rendered a system unbootable by installing the Acronis Secure Zone and then performing other changes to the disk without first uninstalling the Secure Zone. Maybe that problem has been fixed in the meantime, but I won’t trust my disk to this kind of proprietary modification, and I don’t think you should either. I’m vastly impressed with the range and depth of TrueImage, but after using it intensely, I’m not sure I would buy it unless I needed most or all of its flexibility and features. In my tests, TrueImage reliably backed up and restored disk partitions and individual files. It remembered backups that I already made so that I didn’t need to navigate my disk to find a backup file when I wanted to restore it, as I had to do with our Editor’s Choice imaging app, ShadowProtect Desktop. The only minor hiccup I noticed was that it needed a long time to get started—sometimes more than a minute—when performing an image backup of a full partition. My reasons for preferring ShadowProtect Desktop to TrueImage are partly rooted in history: TrueImage has a long record of problems with my system and with other complex systems, and you may want to read users’ reports about such problems on Acronis’s support forum and on the Wilders Security Forum (www.wilderssecurity.com). My other reasons involve the program’s complexity. Some optional features—like the option to build a recovery disk with the third-party BartPE system—require close study of the 257-page downloadable manual. I struggled with the BartPE option for a while before I noticed that it requires a Windows XP or Server 2003 installation CD—and I was doing my testing on a Windows 7 machine. (The BartPE option requires the Premium Edition, but the shortcut for it gets installed on the basic edition.) The latest version doesn’t fix long-established bugs like a dialog box that lets you switch off both radio buttons (in Windows dialogs with radio buttons, one button should be on) so you don’t know which of two possible options the program is going to use. Compared with the no-nonsense interface on ShadowProtect Desktop, TrueImage looks more user-friendly, but its vastness and range can be daunting to the less-experienced part of its audience. Even some of the more basic dialogs can be confusing. For example, in the Disk Backup dialog, you’ll find a button that says “Switch to Disk mode”—even though you’re already in a dialog named Disk Backup. What this means is that the Disk Backup dialog is really a Partition Backup dialog in addition to a Disk Backup dialog, but it confusingly uses the same name for both. TrueImage is a uniquely powerful and wide-ranging app, and I encountered no serious problems with it in extensive testing. If you need its special set of features, you ought to try it out, making certain to test its ability to restore files and partitions on your system. And make sure to visit the support forum on Acronis’ web site for reports from current users. TrueImage has all the features you need, but you’ll need to decide whether it’s the app to which you’ll trust your data.